One of the important problems of mechanical engineering is to improve the workability of construction materials, including carbon and alloy steels. In this case, the quantitative characteristic of workability, as technological properties of the material is normal and is often difficult to realize in a variation of physical and mechanical properties of the material pieces within the party or non-guaranteed (and even unknown) properties of the workpiece material. Knowledge of the true values of workability will calculate the optimum cutting speed in the processing of procurement and thus ensure the best performance in compliance with the optimum period of life of the tool. The paper analyzes the difficulties of the existing approaches to machinability of structural materials and offers a new experimental method for rapid determination of workability, which is based on the use of specific indicators of cutting and simply implemented in the procurement department or mechanical plot. The proposed rapid method of avoiding costly and time-consuming tests showed good agreement with the reference values of the coefficient of workability of carbon and alloy steels brands. Keywords: cutting materials, machinability of materials by cutting, cutting the specific work. Ignatov S.N., Karpov A.V., Raspopin A.P. Evaluating the effectiveness of treatment using the blade of the dimensionless energy criterion // STIN, 2004, № 12. – P. 23-26. Karpov A.V.To the question of management of cutting process on the basis of power laws of deformation and destruction of solid materials // Engineering industry and life safety, 2011, № 1. – P. 37-49. Karpov A.V. 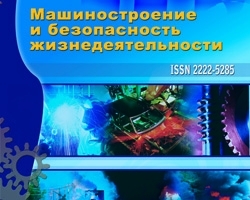 Optimization of сutting processes on the basis of the energy patterns of materials deformation and fracture // Engineering industry and life safety, 2012, № 1. – P. 58-64. Karpov A.V. Energy efficiency of cutting // Bulletin PNIPU. Engineering, materials science, 2012, Volume 14, Number 1. – P. 51-59. Ordinartsev I.A, Filippov G.V., Shevchenko A.N. Reference toolmaker – L: Mechanical Engineering, 1987. – 846 p.
Научный журнал "Машиностроение и безопасность жизнедеятельности" / "Engineering industry and life safety"
Copyright © 2019 Машиностроение и безопасность жизнедеятельности. All rights reserved.